Naturally occurring particles, generated by cosmic rays, could be used to detect concealed nuclear material. US scientists have shown that an inexpensive and harmless technique exploiting these subatomic particles could detect a small block of uranium concealed, for example, inside a truck full of sheep. The International Atomic Energy Agency has become increasingly concerned about smuggled nuclear material. William Priedhorsky, one of the scientists involved in the muon work, agreed that illegal nuclear shipments were potentially a very serious problem and that new methods to track them down needed to be developed. Currently, X-rays are used to try to spot material like plutonium and uranium, but they cannot always penetrate dense objects, such as cars or containers, where nuclear material might be hidden. Now researchers at the Los Alamos National Laboratory in New Mexico have shown in principle that they can detect a small block of uranium hidden in a truck full of animals using tiny particles called muons. 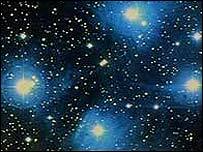 These shower down on the Earth all the time as cosmic rays interact with the upper atmosphere. Muons are completely harmless to humans; millions pass through the body every day. When they meet an object, the muons leave it at an angle that depends on the material - the denser the material, the bigger the angle. This highly predictable scatter pattern is what would form the basis of a new type of detector. The device could be laid out as a platform that trucks could drive on to for testing, or even a kind of conveyor belt for large shipping containers, the researchers said. The Los Alamos team built a test bench, comprising two upper trackers, to record the path of the muons as they arrived from the upper atmosphere, and two lower trackers, to record the path then made by the muons after passing through a test object. The technique is obviously safer than using X-rays. Fewer "images" would also be required to confirm the presence of a suspect object. The main drawback is that such a muon detector would be slow. X-ray detectors can scan large trucks in seconds; the muon detector would take minutes, the researchers said. Nevertheless, the researchers are confident the technique can be improved. "[Our] method is suitable for a range of practical applications in which radiography of dense objects with low radiation dose is required - for example, in surveillance for cross-border transport of nuclear materials." William Priedhorsky, the chief scientist of non-proliferation and international security at Los Alamos, told BBC News Online that there was every possibility the problem of illegal nuclear shipments was growing. Only 25 kilograms of nuclear material is needed to make a Hiroshima-sized bomb. He said: "The total amount of material that has been caught in nuclear smuggling totals about half a critical mass - half the amount that makes a nuclear bomb. "And if we assume that only a small fraction of that that has been smuggled has been caught, there could be bomb quantities of nuclear material loose already, which would be a great danger to the world. "If a tiny fraction of this nuclear material got into the wrong hands, the danger is staggering."